Every object a preschooler comes into contact with during the day can be drawn or represented by a shape or a collection of shapes. Introducing geometry to children is nothing more than a study of the shapes they have already encountered. A rhombus is a quadrilateral, meaning that it has four equal sides. A rhombus looks like a square that is tilted to the side. 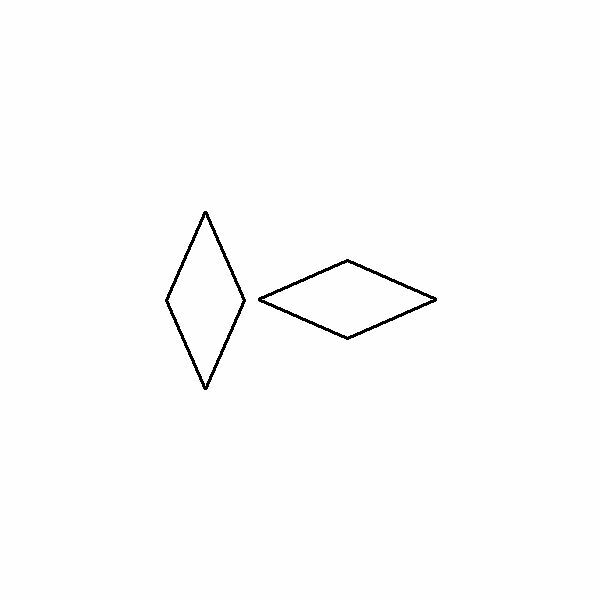 Turned on its corner, a rhombus is shaped like a diamond. A rhombus differs from any old quadrilateral because its four sides are all the same length, a fact that will fire up your students' interest. Rhombus Walk: After introducing your preschoolers to the rhombus shape, take an observation walk through your school or neighborhood. Ask the children to be on the lookout for rhombus shapes while you walk. Give children binoculars to use while walking, as well as notebooks and pencils to draw pictures of any rhombuses they may encounter. Bring a digital camera to capture rhombuses in action in your school or neighborhood. Cutting and Coloring Activity: Use our downloadable worksheet to create cutting and coloring worksheets for children. The act of cutting out or coloring rhombus shapes will reinforce the idea that a rhombus is a diamond shape with four equal sides. Rhombus Creatures: Use the colored rhombus cut outs (in the media file) or create your own large and small colorful rhombus cut outs with construction paper. Be sure you have a large variety of sizes and colors. Ask children to create an animal, person or scene using the rhombus shapes and glue sticks. The children can work collaboratively on this project by gluing all of the rhombus creations onto a long sheet of butcher paper. Create a scene in action by strategically placing the creatures and buildings on the butcher paper. Four Corners: Explain to children that quadrilateral shapes have four sides and four angles, or corners. Hold up a large rhombus shape for the children to see while pointing out the sides and angles. Count to four together with the class while pointing out each angle and side. Have the children brainstorm how many other shapes they know of that have four corners and four sides. Rhombus Bodies: Invite children to circle time and ask them to show you how to make a rhombus or diamond shape with their fingers. As a movement activity, ask children to choose a partner and create a rhombus shape using their bodies. For another challenge, ask children to create rhombus bodies in groups of four or more. If you have any other rhombus activities, please feel free to share your teaching ideas and experience in the comments section below.